In 2011, I set out to create an app named Hugecity to help people discover what is happening around them in real-life, rather than simply connecting online as most social networking applications had done. Over three years I grew Hugecity to a million visitors a month but struggled with retention. I observed real user behavior and received great feedback. Instead of raising additional rounds of investment to experiment on how to retain users, my team and I decided to sell Hugecity to the global "things to do" company, Time Out. Today, I run their Labs division where I am using what I learned to personalize and grow for our 40M monthly visitors around the world. In 2012 Mark Hendrickson wrote about The Uphill Battle Of Social Event Sharing. This blog is my attempt to take his thinking a step further, to describe my understanding of event discovery and the fundamental difficulties presented by events as a content type. Like Mark, it is my hope that other product designers can learn a thing or two from my experience. The challenges I describe here apply directly to events, but they can be used as a case study to advance thinking about other content types as well. $22B was spent on admissions to live events in 2014 in the US. Spending on attending events is growing, but 90% of people look for events only once a week or less. Despite this lack of regular visitors event discovery is highly competitive with no clear winner. I used to think this was due to a lack of a centralized event database, so I tried to build one. Unfortunately, most people privately share events so an app cannot rely on users to build an event database. However, Facebook is the first place that most events are created and an app can gain access these events. Half of most people are planners and half are procrastinators which leads event consumption to happen in waves. When people search for events they want to filter by category, just announced, time, and location. They also want no more than five to ten personalized results. Personalization is easy when a user has lots of active friends and likes a lot of Facebook pages in the area, but it is difficult when they don’t. Additionally, events have a short shelf life and diminish in value the farther away they are. This makes it difficult to maintain and scale a consistent experience for less connected users. Tastemakers are the 10% of users that return daily. These tastemakers are key to providing an order of events for less connected users and to spreading awareness of an event discovery platform. It takes time to maintain and scale a tastemaker community for multiple cities. 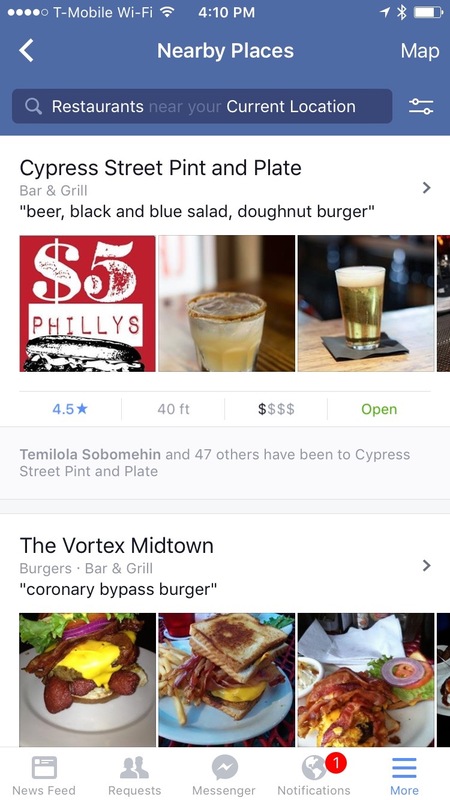 Finally, Facebook could easily dominate event discovery but it can afford to sit on the sidelines and wait for an app to come out that works and copy it. I have not solved event discovery, but I have discovered a lot of ways that don’t work. Time Out has allowed me to continue experimenting and we will have some new products coming out later this year. Eventbrite published research this year that showed the share of consumer spending on live experiences relative to total U.S. consumer spending has increased 70% since 1987. Social media has accelerated the growth of this experience economy and it will continue to do so. Social media feeds on our vanity by allowing us to share tailored online content to convince others we are happy, attractive, smart, fun and so on. Events provide perfect photos, videos, and statuses to share. 79% of millennials will buy an experience over buying an object. With millennials now making up a quarter of the US population the experience economy will continue to rise. Today we are attending more events than ever, but most still rely on word-of-mouth to find new and unique gatherings. No app or website has solved discovery of things to do. From afar event discovery seems like a tasty low hanging fruit. Most of us have had an experience where we missed a cool event only to find out about it on social media after the event had past. This feeling has been given the name FOMO, or fear of missing out. FOMO has driven many first time entrepreneurs including me to create a company to solve this problem. All we need to do is create a good service, grow to a decent user base, and charge for advertising, ticketing, deals, or providing an event feed. Only if it was that simple. The largest media companies to the smallest blogs all have lists of things to do. Successful companies involved in event discovery, like Time Out, give their content away for free while their real business is driving traffic to advertisements. They provide a wide variety of content, not just lists of things to do. Small blogs also give their work away for free but instead of revenue from advertising, they are fueled by the rush caused by positive feedback from followers. These blogs can become very hot in a local market but rarely scale past one or two small sponsorship deals and burn out. Event managers and promoters will pay to promote their events but they need a platform with a proven user base and a sophisticated advertising system that allows them to target specific audiences. Here, new event promotion services compete directly with Facebook where an event manager can easily define and reach their target audience and get measurable results. There are no barriers to entry into event discovery, so even if an app provides a far better discovery service and manages to gain a little revenue, it is extremely difficult to be noticed amongst the multiple new players. The sheer number of startups in this space make investment, partnerships, marketing, and revenue incredibly more competitive. Most of the investors we approached had invested in event discovery and lost their money. This includes Y Combinator, who after flying my team to San Francisco told us that they have had an event discovery business in almost every cohort since our beginning and none have been successful. They simply did not know how to succeed here. Most people do not create events and most event creators don’t do it that often. Additionally, event creators rarely create events outside of their own city. In event discovery, the value of an event decreases dramatically the farther away it is. Luckily, there are enough event creators in each city to supply hundreds of events every day. However, creating an event and adding it to multiple platforms takes time and is repetitive. Event creators choose which platforms they spend their time. Unless you have a large user base, event creators won’t choose your platform to add their events even though they are incentivized to spread awareness of their events as far as they can. As a result, an event discovery startup cannot rely on its users to add events to their system. Luckily, many ticketing and social media platforms provide APIs, or feeds for events, where companies can aggregate a large event database. Last year Live Nation promoted 22,000 events, Brown Paper Tickets promoted 200,000, Eventbrite promoted 1.7M, and Meetup promoted 6.6M. Facebook reported that it was creating 16M events each month in 2014 and now has 450M monthly active users of Facebook events. Today, Facebook does not have a strong event discovery solution. As you can see most event creators choose Facebook as their first place to share their events. It is the largest supplier of events by far and its free. Unfortunately, Facebook’s event feed is difficult to reach. It is not as easy as getting a Facebook developer account and asking them for all of their events. Facebook’s information is created and stored by its users and an app needs to ask its users for permission to access their data. When a user signs in to an app using the Facebook login, the app can request permission to access the user's events, their likes, and their checkins. Unfortunately, the current version of the platform, only allows the app to receive friend’s events, likes, and checkins if they also have signed in to that app. As long as a user doesn’t change their password or continues to use the app, the app can regularly call the Facebook API to refresh that user’s event list. Furthermore, once an app stores a Facebook page it can regularly refresh the event list for that page. When an app requests events through the Facebook API the growth of the number of Facebook events in the third party app is asymptotic. The number of events grows very quickly with the first few signins and approaches parity with the Facebook event database but never reaches a complete duplicate. Events are location based and different cities grow at different rates. We saw that if we got ten to twenty people to log in in one city we would have a enough events to provide a decent daily event discovery service for that city. Social networks are essentially systems for distributing content among people who care about each other, and the frequency at which its users can share that content on these networks is critical to how much value it’ll provide them on an ongoing basis. Events are unlike other, more frequently shared content types such as status photos and updates which can be shared multiple times each day. We noticed this difference lead to three different types of event sharing. Most people are picky about who they ask to join them for real-life encounters. They chose to private direct message a friend or small group of friends about an event. "I just found this and thought you would be interested" or "would you like to go?” Normally there is a discussion around the event about when to go, where to meet, what else to do, who else can come and so on. We spent a lot of development time to create our own direct messaging service, but now this is fairly simple and free using the Facebook Messenger Platform. Two other kinds of sharing came from event professionals who style themselves as influencers. At Hugecity we called these users, tastemakers. These people are either directly involved in the events like performing artists and promoters or they are fans of event categories like bloggers and group organizers. They shared anything that would draw positive attention to their events. For example, we created an algorithm to list each city’s top 10 events everyday. We posted these lists on the Facebook walls of the events that made the list. Tastemakers involved with these events would share our list of top 10 events boasting that they had made the list. Today we see the same type of sharing when an event is reviewed by Time Out. Tastemakers also used Hugecity to create and share their own lists of events. At first they copied links to events from Hugecity and built their own lists on their websites or emails. We then built a tool we called a widget that allowed tastemakers to easily show off their lists of events on their blogs and websites. These widgets were interactive advertisements for Hugecity imbedded on highly influential websites surrounded by valuable content. Most users don’t proactively seek out events to attend as you might suppose. People simply don’t go to that many events, and of those they do attend, many are not anticipated with a high degree of certainty. We found that 90% of our users only came to Hugecity once a week or less. 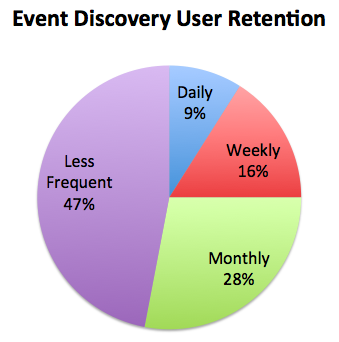 Other event discovery tools found a similar split of usage. In today’s time starved world, time is a luxury. People react to time in two different ways, they either plan or procrastinate. People who plan seek out interesting events to attend in advance. They take concrete steps to discover new opportunities and evaluate them. They rely on their calendars or other notifications to remind them of their plans. People who procrastinate desire to conserve their free time. They view planning as a taxing imposition on a limited resource. For them, planning is a higher-risk endeavor, and usually they’d rather not plan anything at all. These two camps of people lead consumption of events to occur in waves. In the music industry, there is rule of thumb that 50% of tickets are sold when the event is first announced and the next 50% are sold the week of the event. There are little to no ticket sales between these two weeks no matter how long these tickets are on sale. On a weekly basis, event discovery traffic increases dramatically towards the weekend with Monday being the lowest and Saturday being the highest. Saying we are attending on Facebook is more aspirational than than buying a ticket. It is far from a guarantee that they will actually attend. I have met users that click attend on all Facebook event invites just so they can remember the event for later or provide positive feedback to the person who invited them (similar to a “like" button). When someone doesn’t buy a ticket, they won’t have any skin in the game and can afford to miss the event. Most people resist making advanced commitments before they absolutely need to make them. People desire to keep their options open in case other conflicting opportunities emerge as the date and time of an event approaches. If they can afford to wait and see, they will. We noticed that users were more likely to attend an event if they were personally invited by their friends. Even if someone sees that a friend is going to an event, there is a psychological need for people to get personally invited to that event. The strength of the invite varies by which platform the invite was sent and how many people were included on the invite. A Facebook event invite is weak but a personal direct message to only one person is very strong. With zero customer loyalty and zero switching costs event discovery companies need to always be on the look out to reduce the cost of customer acquisition. Invites don’t always cut it. In an ideal world users to work on a platform and share links to their work on that platform. Instead many people turn to google to search for things to do. Time Out taught me that a strong SEO strategy can regularly drive traffic the 90% of people that don’t look for events that often. Ten percent of our users returned to Hugecity daily. They reached out to us and told us who they were, what they used Hugecity for, and recommended changes and new features. They came to Hugecity primarily to create lists or conduct research. Some were building a following and they shared their lists of events or venues with their followers. Others wanted to find out who was creating events in the area so they knew who they were competing with or who they could partner with in the future. Others were gathering venues to decide where to perform or set up shop. For example, Uber’s community managers used Hugecity when they expanded to a new city. Hugecity helped them learn which events were going to be big in the months ahead. Uber then partnered with those event creators to spread the word about Uber. After they launched in a new city, Uber used Hugecity to find out where they should send their cars each day. We discovered that many companies like Uber depend on events but have little insight into the local event industry. Unlike most users, tastemakers want to be instrumental parts of how their peers discover events. They get a psychological rush from receiving positive feedback for reviewing, curating, and recommending events. This feedback drives them to share more events in the search of subsequent highs. They either use social media or build their own blogs to share their tastes. They want to be the first to know so they can become a stronger source of discovery for their followers. If they see that a useful event discovery platform competes with their website they will collect what they need from that platform but go out of their way not to improve or share from it. The best way to combat this is to make the platform the place where they can share their tastes and get feedback. They should be given recognition for the work that they do. Dan Zarrella’s Hierarchy of Contagiousness says that a successful platform this can be done by using the tastemaker's name as much as possible on events they have interacted positively with. Link their work to other event recommendations they have. Give them a personal page where they can show off their taste. Tastemakers deserve exclusive treatment due to the value they bring to the platform. All events have a location, start time, and end time. At Hugecity we mapped events in three dimensions using x and y to indicate location and z to indicate time. We hid events that lasted longer than 6 days to avoid showing our users the same event everyday. These long running events were rare and they were normally art exhibits or sales. The time component of events makes events more complicated than evergreen content types because events have a short shelf life. Before an event transpires, it provides social value notifying others of the opportunity. But, afterwards, its value to the network drops to virtually nothing. Unfortunately, few events are created more than a month in advance. Location is another inherent limitation to an event’s value. Events provide most of their value to others when those users can travel near enough to join. This is especially problematic when trying to expand the service into new locations. People who encounter the service from non-urban locations have the hardest time, since there is a lower selection of events in their area. Like events, users are location based. They tend to only create or interact with events in their city and rarely outside of it. This makes personalization for travelers difficult because the information from their friends and likes is not enough to make a strong recommendation. These limitations make it difficult to provide consistent discovery experience in multiple cities. In accounting there is a term called contribution which means, how much does it cost to make one more. After one city has been established, it takes the same amount work and money to establish the next city. Hundreds of events occur in every city every day and many companies including Hugecity have near complete list of all of these events. Just showing a list of all the events does not lead to a successful user experience. Tastemakers, crave as much information as possible. They loved Hugecity’s map of all the events we knew about. They could dive deeply into neighborhoods or multiple events at a single venue. Unfortunately, seeing all of the events available overwhelmed the rest of our users. Both planners and procrastinators told us they wanted a service that they could go to, find what they want, and leave quickly. They asked for a limited list of just what they were looking for. Planners are interested in a limited list of events that have just been announced and want to be reminded of the events happening that they have planed for. Procrastinators are interested in what is happening this week, today, or just right now. Creating a limited list is not as easy as it sounds. At Hugecity, we built and tested a recommendation algorithm which determined the probability the user would like to go to the event. Since this probability varied for each user, each user saw a different, personalized event list. We used the information we received from Facebook and our tastemakers as variables in our algorithm. Still, no event order will be 100% correct. Cunningham's Law states "the best way to get the right answer on the Internet is not to ask a question, it's to post the wrong answer.” This is what drives Reddit, Wikipedia, Trip Advisor and much more. When we show these events slightly out of order, it is a call to action to change the order. We allowed approved local tastemakers to change the default order of events using a reddit style voting system that only tastemakers saw. We found this combination of a strong algorithm and tastemaker recommendations had the best result for event discovery. Tastemakers are location based and at least one is needed in every city, so this method takes a little time to scale. With the mission to "help people do more things with their friends in the real world," you would think that Facebook would have solved event discovery a long time ago but they have barely touched it. Facebook Events has 450M monthly active users and creates well over 16M events a month. This usage dwarfs any company in event discovery or ticketing. When I visited Facebook in late 2013, I was told “Events was the last thing that Mark Zuckerberg coded (so it is the last thing that he cares about)... There is a list of things that are not going to be touched and event discovery is on this list... If you can’t prove that it will move the dial by $500M today, Facebook probably is not going to be interested." At that time, Facebook's strategy for events was tied to the strategy for pages and location under Josh Williams, formally the CEO of Gowalla. When I visited, Josh had just left Facebook and his three person team with no one in charge. Josh had used his experience with Gowalla and, in my eyes, created the best location discovery app, Facebook’s Nearby Places. It used all of the information available to Facebook to predict where you would like to go. 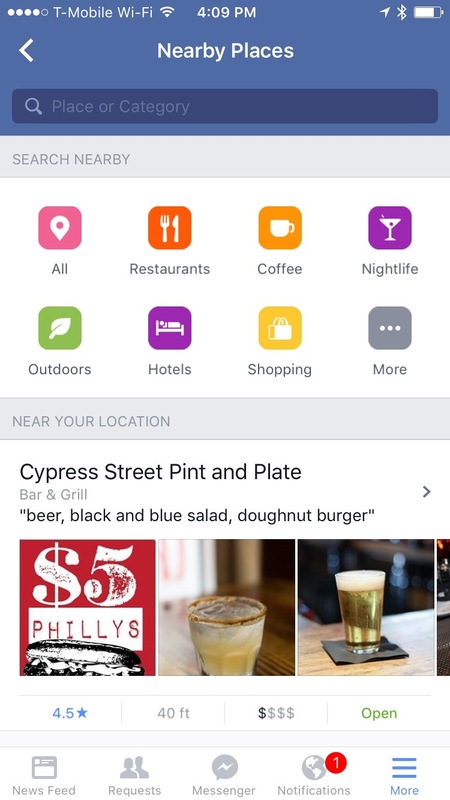 Nearby would have killed Foursquare and Yelp if Facebook had released it as a standalone app. Instead it was and still is hidden under the more button on the main Facebook app. Before Josh left, I was terrified that Facebook might release a standalone Nearby Events app. It would have been a searchable map with events very similar to Hugecity, but they never did. In the beginning of 2014, Zuckerberg suggested events could be unbundled but to this day nothing has happened. Facebook has been timid about standalone apps since the release of Messenger. Forcing all users to download a standalone events app would be worse. A standalone events app should be launched similar to the way Groups was launched under Facebook’s Creative Labs. 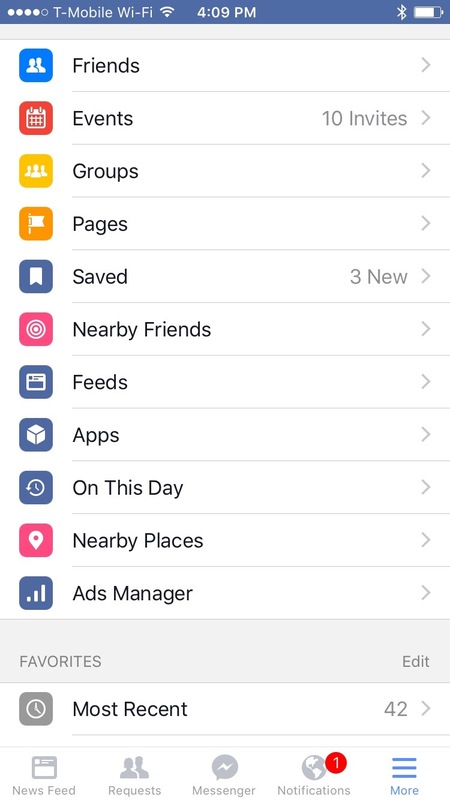 Groups is still accessible through the main Facebook app and website but the separate app provides a richer experience for the users that want to go deeper. The main Facebook app could have a popup to remind users looking at the Events tab linking to download the standalone events app. So far, any changes they have made to event discovery seem to be haphazard, randomly showing events from the next few weeks with no explicit order. Facebook is treating events similar to the way they treat statuses in the newsfeed by showing events to us in some unknown order. Event discovery needs an open order that can be manipulated as well as a way to filter by category, just announced, time, and location. Event details have barely changed since they were created. In Facebook, a birthday has just as many details as a massive music festival. Facebook could create an advanced tool set for larger event creators that includes multiple locations, multiple times, multiple ticket levels, attaching other pages like bands, and more. The event category list is tiny compared to the category list for pages, where users can also choose up to three categories but in events they are limited to one. At Hugecity we scanned the wall of the each event and pulled out audio and video files and highlighted them at the top of the event. Facebook could take this a step further by allowing users to add images, audio, and video from the creation of the event. During the event Facebook could allow event creators to geofence an area to collect all of the public Facebook and Instagram posts during the event from attendees. Or at least highlight an event hashtag. This combined with Facebook's live streaming could allow users to see backstage and take part in events from all over the world. Even with a decent standalone event discovery app, slightly improved event promotion and ticketing, Facebook would have an easy path to $500M. They already have a great portal to promote events but Facebook could go further. Event promoters are limited to guessing who to target using the current portal. They would pay more for an option to use Facebook's own prediction algorithm to automatically place ads in front of users that are the most likely to go to that event. Today, event managers come to Facebook to create and promote their events and then leave Facebook to create tickets. Facebook has already created one of the most affective self-serve advertising portals. Why not take it a step further and add a self-serve ticketing portal. At a cost of 2.5% + $0.99 per ticket we could say goodbye to a fragmented ticketing market. Facebook would quickly take a bite out of Live Nation’s $5.8B revenue and Eventbrite’s $1B revenue. If they allowed users who could not go to the event to resell their tickets, Facebook would also eat up the secondary ticketing market and Stubhub’s $2.8B revenue. On top of this, Facebook would maximize each events exposure and gain an even greater audience by providing a free event feed and widget. Waiting for Facebook is not a choice we have, but as Jason Calacanis explains, building in someone else’s playground can be dangerous. When an app is being built in another ecosystem, they can see everything that that app is doing and all the metrics behind each feature. If the app is successful, the platform will be watching it closely and can see everything that is working and everything that isn’t. As soon as they see an awesome new feature, they can put it on their own road map. The app is basically doing free research and development for the platform. Not only are they watching this app but they are watching the 50 other companies in the same field building on their platform. They will be able to pick the best features from all of these competitors and combine them for an incredibly strong product. Additionally, all of the app's work to gain users and interactions also makes the platform bigger and stronger. If the platform feels like it, they can and will change the rules. Look how Facebook changed the rules and crippled Zynga. We could say, "If we build something really valuable, Facebook will buy us." Building our business to be bought by someone who we rely on and can rebuild our product better than we can and distribute it to instantly many more people puts us in a really bad negotiating position. Due to the surge in acquihires, mentioning of a potential acquisition from Facebook is a big red flag to investors. Hundreds of events happen in every city every day. In the past Godzilla had to attack a city for it to have amazing events happening in it. Today our exposure to the internet has caused us to have a more refined taste for events everywhere and we are getting what we want. Despite all of the challenges I have mentioned, there is far to much value in knowing what is happening around you to leave it untouched. I hope that another startup comes along that develops insight into an angle of attack I have missed. Or, perhaps more likely, another established company with an existing event will provide users with a strong event discovery solution. I am still working on creating something great for event discovery so stay tuned. Until then I have identified a couple alternative ways forward. Companies can concentrate on an event niche reduce competition and have an easier path forward. 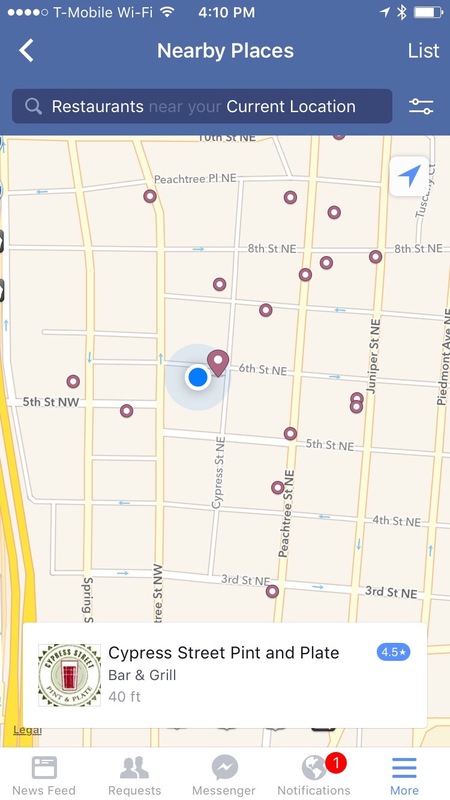 Event niches can be created by location, duration, attendance, category, rarity, privacy, and cost. There have been some strong successes in event categories like Active which concentrates on athletic events, or Lanyrd which concentrates on conference discovery. I have not seen a strong solution for long running events (plays, events, exhibitions), tech events, biking events, and many more. Personally, I would like to see a high-end or VIP event discovery. Time is a limited resource and we are spending more on going out. We are looking for more unique experience to say we went to on social media. This should mean that people will pay more for even rarer experiences. Companies like Experience already allow users to pay to move a few rows forward at a concert, but tastemakers can provide access to the artists that create the event. For example, here in Atlanta I know enough people to see an amazing concert AND have a beer with the band after the show. For now this elite experience is only for friends of friends of the band. Unfortunately, my connections aren't strong enough to have this experience for all events in Atlanta and when I travel. Only if I knew the right people I could have this experience for every event. I would like to see an Airbnb for events, where you pay more for an entourage like experience and you rate the host and the host rates you. There is a movement towards a text based concierge. So far I have only seen it in place discovery and information gathering, but I would like it to be extended to event discovery. The revenue model could be very similar to travel agencies where a fee is charged on top of booking. Again the concierges, or hosts, would be local tastemakers but they would not have to go out with you, just set it all up. Furthermore, tastemakers normally have an in with local ticket providers and venues so they would be able to provide a discounted experience or pocket the difference. All ticketing companies have event discovery but they rarely show events that are not ticketed by that company. Tickets not owned by an event discovery company have a not very profitable partner kickback. Still, I believe even a small ticketing company can do extremely well if they had a showed all events despite the ticketing provider. Ticket pricing can be very difficult for event creators. Getting pricing wrong can have big effects on the event turnout and the longevity of the artist or group. Ticketing companies need to provide the tools to help event creators determine what price works best for each of their events. In addition, they could run several different ticketing experiments like allowing promoters to use the dutch auction method of starting prices high and dropping the price until the tickets sell and giving the difference back to the people who overpaid for their tickets. Promoters would get the most money they could for each ticket sold and this would limit scalpers from taking profit out of the pockets of the people actually putting on the event. We never ended up charging Uber for helping them expand to new cities, but we could have. We could have gone much further. Similar to the way Facebook is watching each company on their platform, we are watching events, pages, the audience, and tastemakers for all cities around the world. We see which events are performing and which aren’t. We see what is working in some areas, what is missing in others, and roughly when to have it. This knowledge can help event creators reach their followers and it can help brands reach their audience.